The last picture show… the last thought on my mind as I pulled into the parking lot at 5:40 AM on the morning of Saturday, December 20, 2014. Normally at this hour there would have been space along Porsche row to park among my friends. However on this morning, all of the stops had been pulled out, and both sides of the row were filled (and not just by Porsches). I knew there was the potential for this morning to be over the top regarding attendance, and even though I arrived earlier than usual, it quickly became apparent based upon the large crowd assembled, that the morning had the potential to deliver up an epic event. 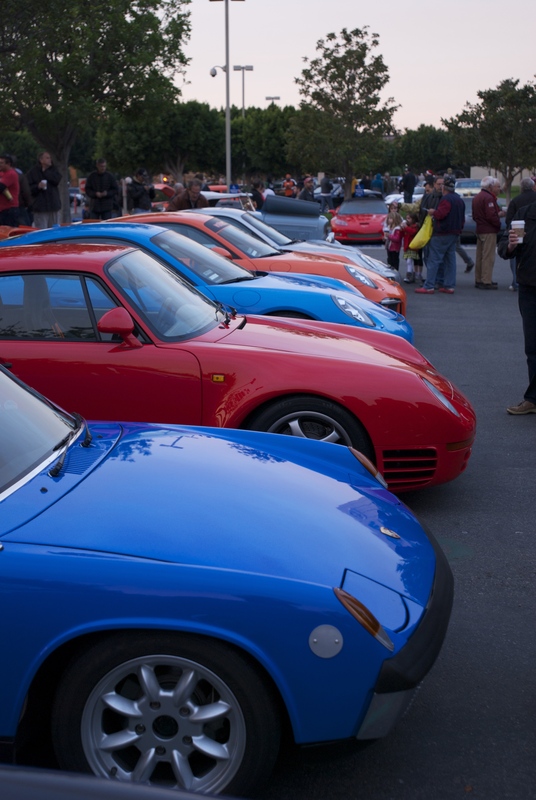 My first stop was to visit with those friends parked along Porsche row, and check out the variety of cars assembled. Parked together as a group of 4 cars was this rare sight, and a unique collection of supercars. 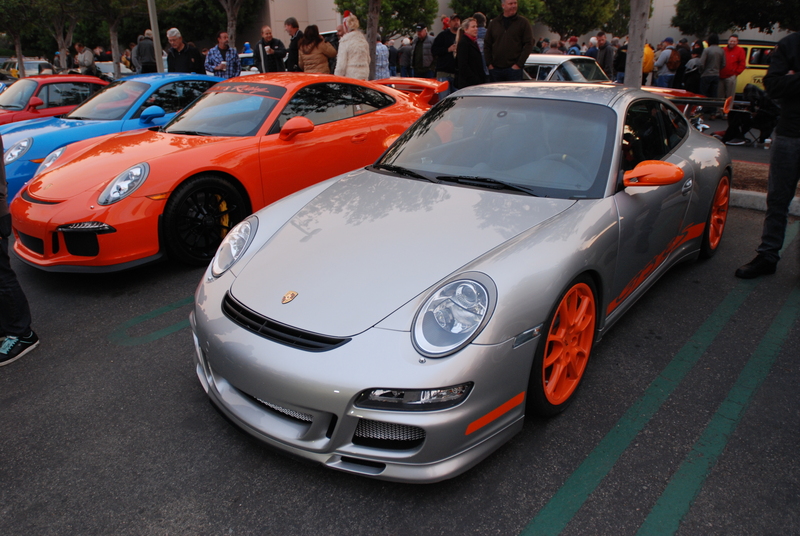 First up was the silver and orange Porsche GT3RS seen below. 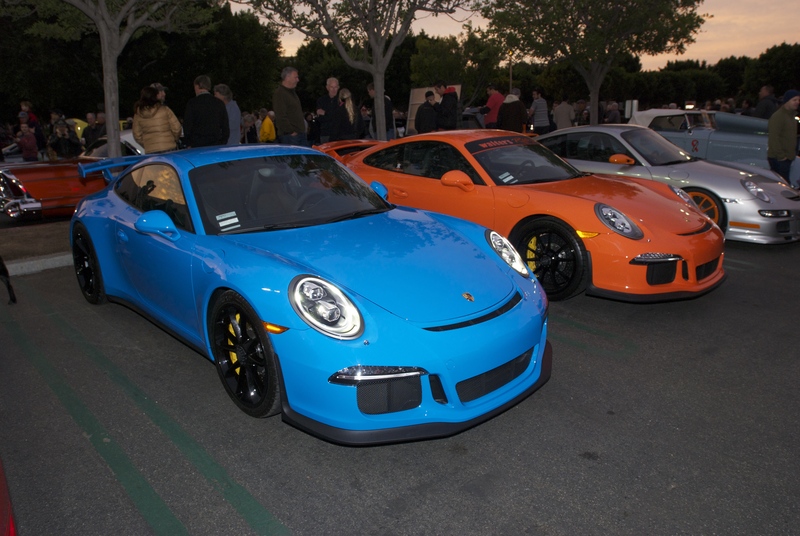 Immediately to its left, was one very unique, 2015 Gulf Orange Porsche GT3. 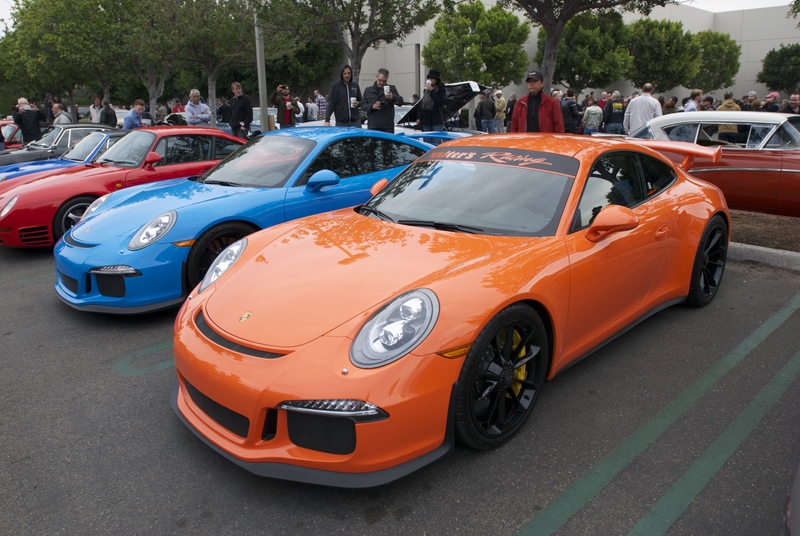 And this was not just any Gulf Orange GT3, but the sole 2015 GT3 to be painted and delivered in this rare color. Parked to its left was another unique and also new 2015 GT3, in this instance a “PTS” (paint to sample) GT3 in Mexico Blue. 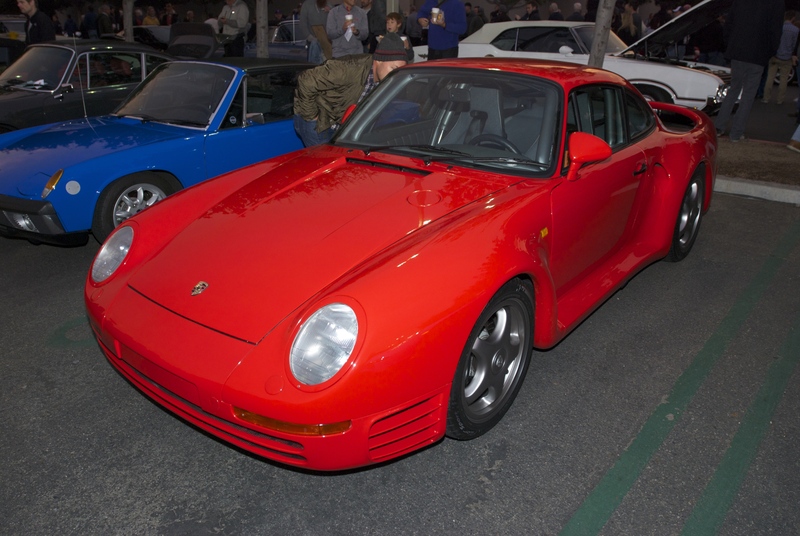 Rounding out this unique quartet was Porsches first model to be given the supercar moniker; one very rare, guards red 1988 Porsche 959S. 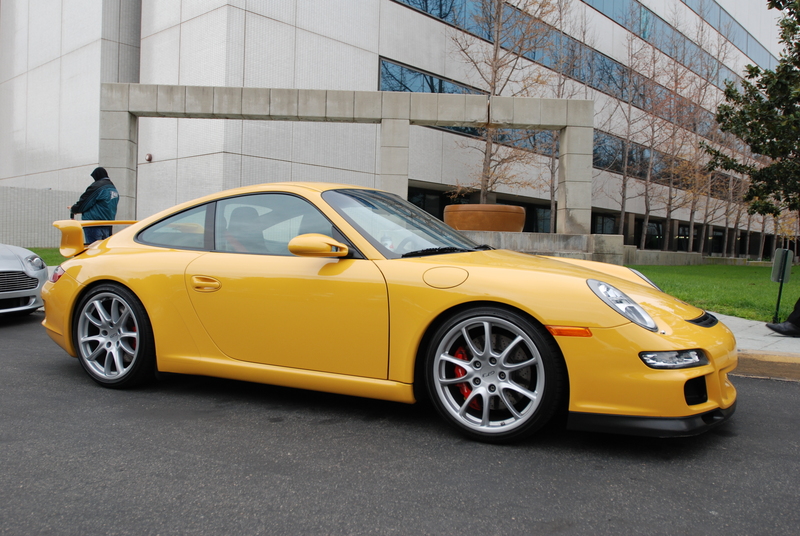 Produced in limited quantities from 1986 through 1989, only 337 type 959 Porsches were built. 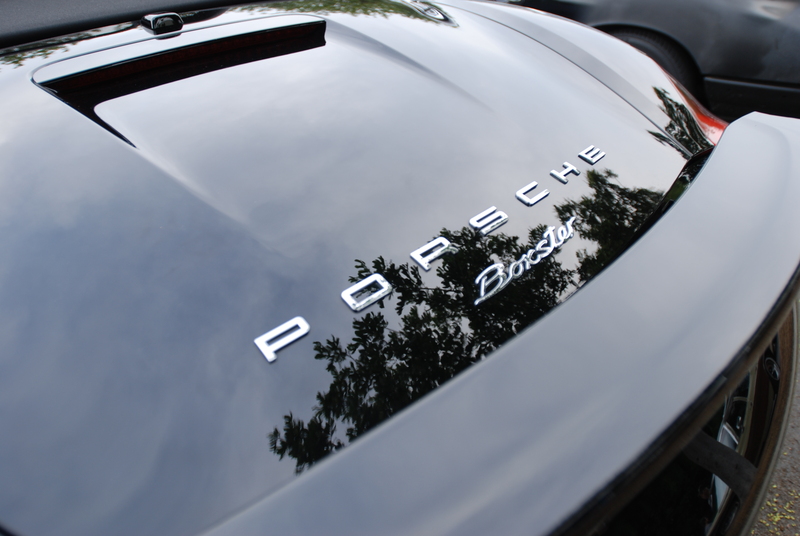 And of those 337, twenty-nine were built as the 959S model (the even higher performance “Sport” option), as compared to the base model/”Komfort” package. Another of the classics on display in the featured lot was this early 1960s vintage Ferrari. 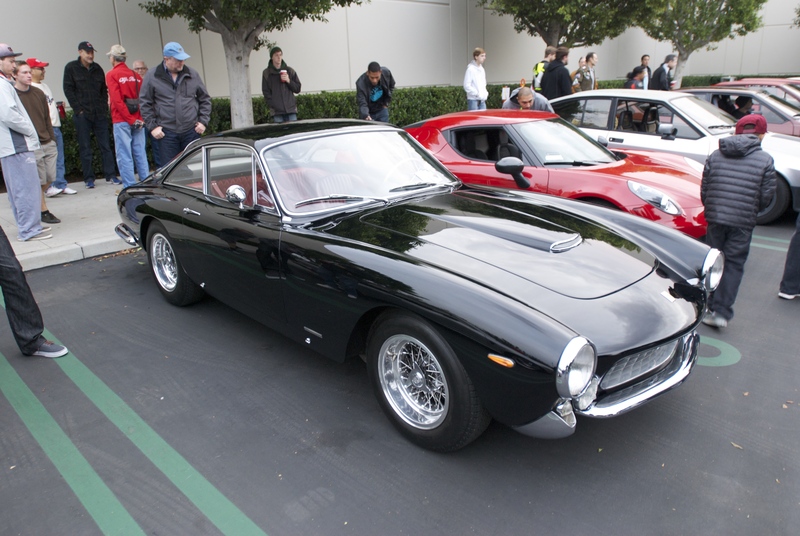 As seen below, a beautiful black over red, Ferrari 250GT a.k.a. Ferrari Lusso. Produced in very limited quantity, this 250GT Lusso represents one of only 351 examples built between 1963 and 1964. 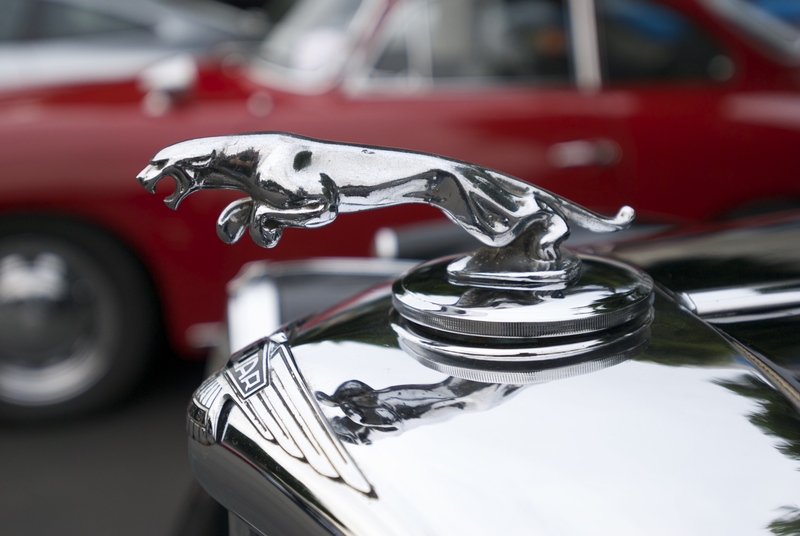 Parked across the lot in the overflow section, was the Jaguar touring sedan (seen below), complete with its classic radiator cap. and what one smartly dressed Porsche GT3RS was wearing; a fresh set of BBS (E88), 3 piece modular race wheels as seen below. And did I mention the crowds? Below is an example of the volume of excess vehicle overflow that was experienced Saturday morning December 20th. The rear parking lot at the recently completed Marriott hotel suddenly filled, becoming an extension of the primary show, as did the Yardhouse restaurant parking lot located to the west. 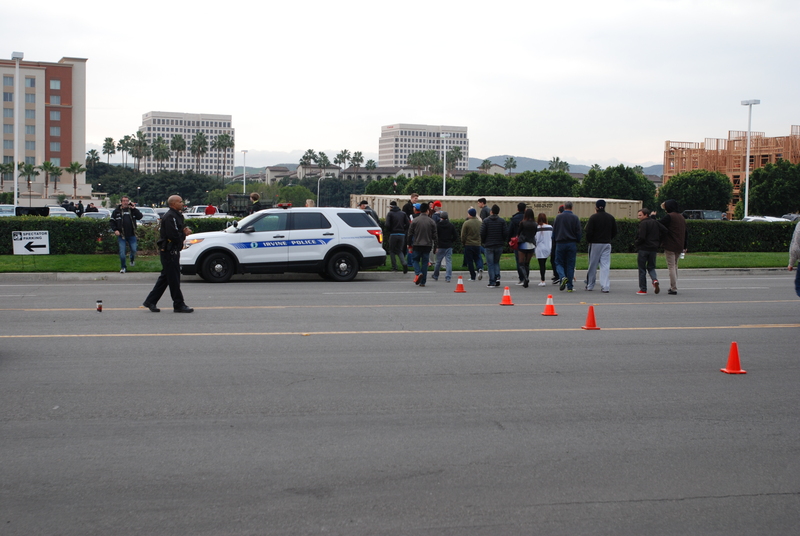 Fortunately, the ever-present Irvine P.D. quickly assumed the role of pedestrian traffic control. 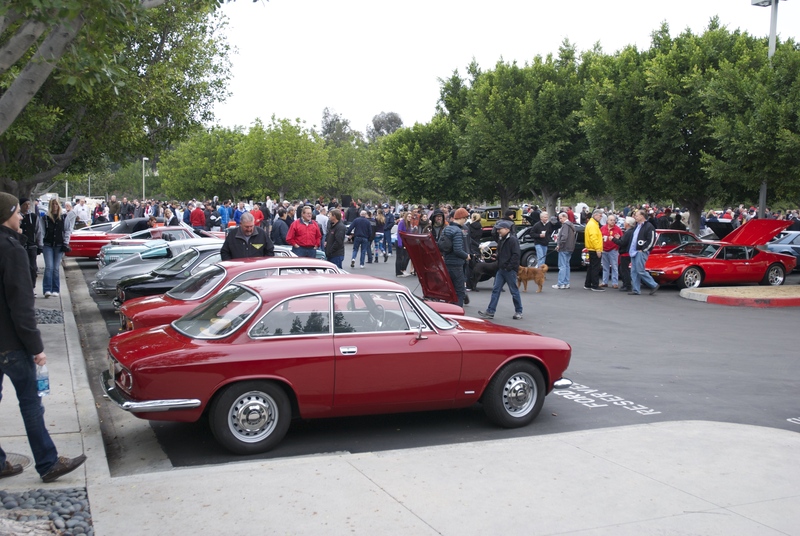 Unfortunately many of those that arrived late only to find closed parking, and who were turned away, responded by making less than gracious comments to the long time hosts of cars&coffee, in the form of obscenity laden rants. So wrong on so many levels, and with their ultimate impact yet to be realized. Back over at the main parking lot, the crowds continued to swell. Making my way back along Porsche row, and with the morning haze burning off, I witnessed firsthand, the previously muted colors come to life, delivering up their full intense, saturated color. 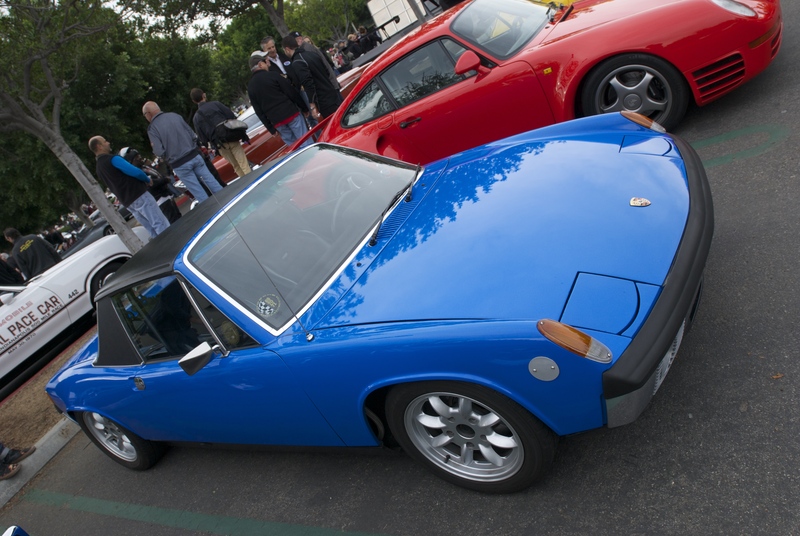 Parked at the end of the rainbow-hued collection of Porsches, and next to the blue 914/6, was a study in contrast; a monochrome 911 beauty in Slate Gray, and on display courtesy of the company Autokennel. One very cool 1973 911 RSR / ST backdated recreation, the car’s owner having used a 1984 Porsche 911 Carrera 3.2 as the foundation for his project. 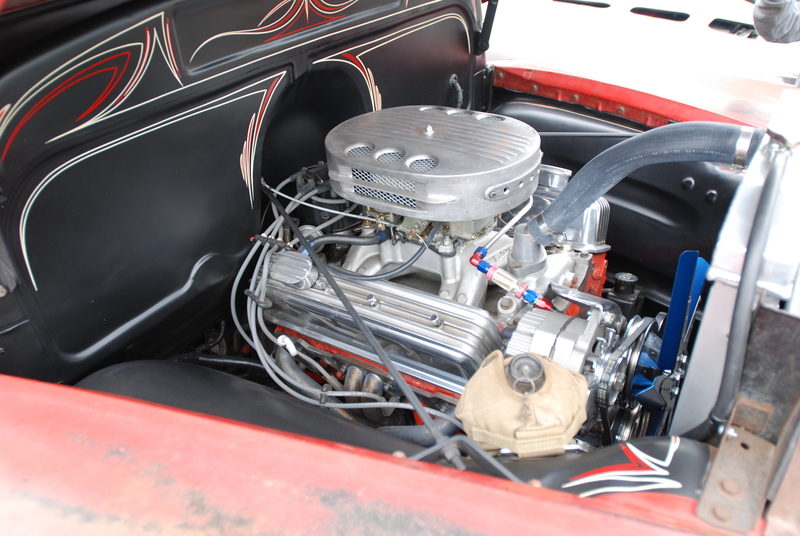 A close up of its modified, 3.2 liter, carburetted twin plug flat six. 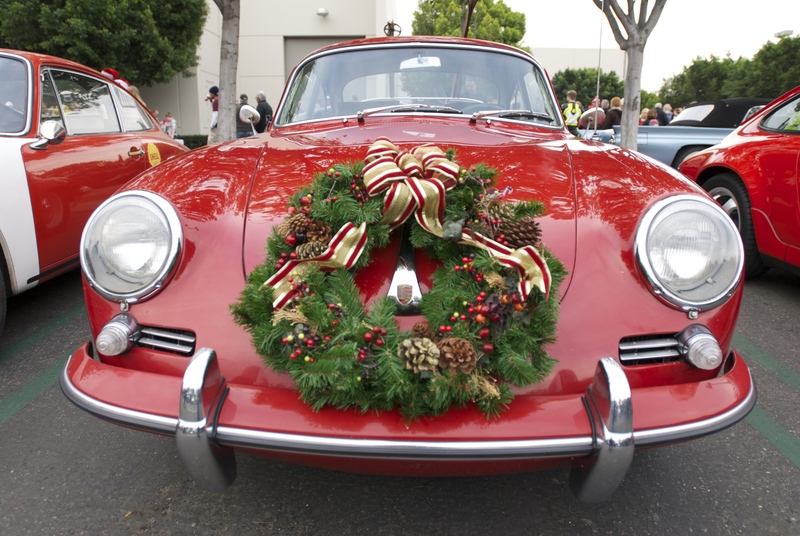 A little further down the row was the sole Porsche to come decorated for the holidays, appropriate since we were only five days away from Christmas. The remaining three Porsches parked together on Porsche row, each representing a different model range. 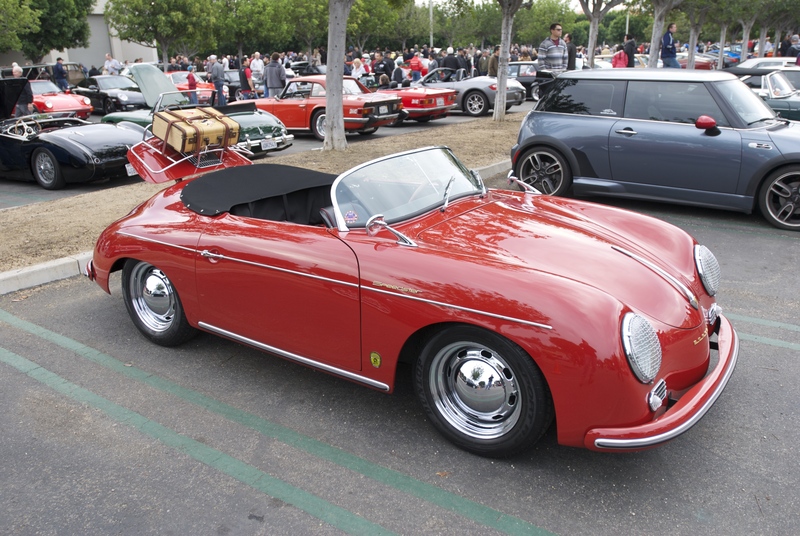 Starting with the car in the foreground, the red 1966 Porsche 911, represented the 1965 – 1973 ” Long hood” series. Parked In the middle, was the silver Porsche 993 Carrera representing the 1995 – mid 1998 model series. Last but not least, was the red Porsche 911 Carrera coupe, representing the 1984 -1989, “Short hood” model range. 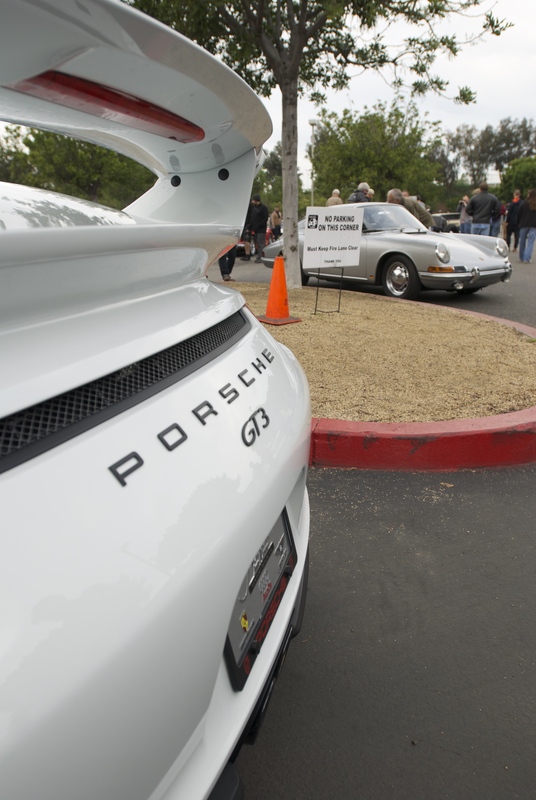 An instance of the old and the new; the silver, 1966 Porsche 912, and a brand new white, 2015 Porsche GT3. Another of the events weekly participants over the past six years, complete with vintage luggage. and representing BMW, one of a handful of beautifully turned out models. 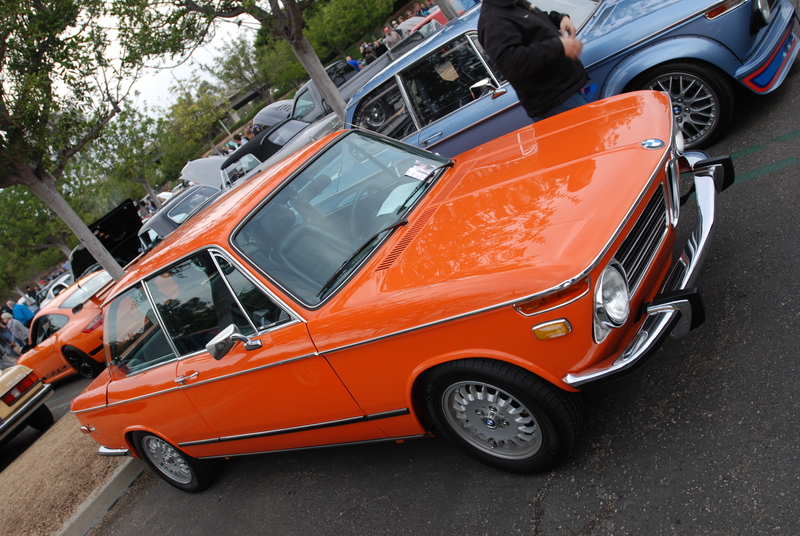 As seen below, a pristine example of a pre-1974 BMW 2002 Tii. 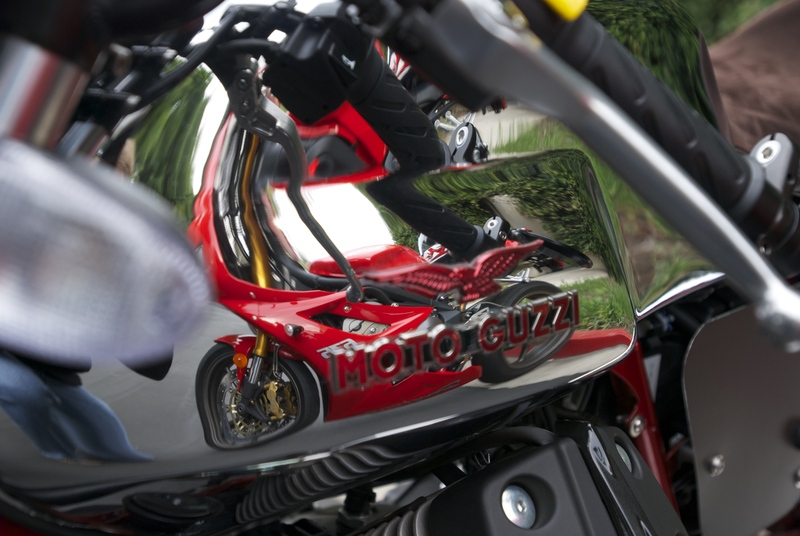 and each with a unique approach to engine compartment aesthetics. 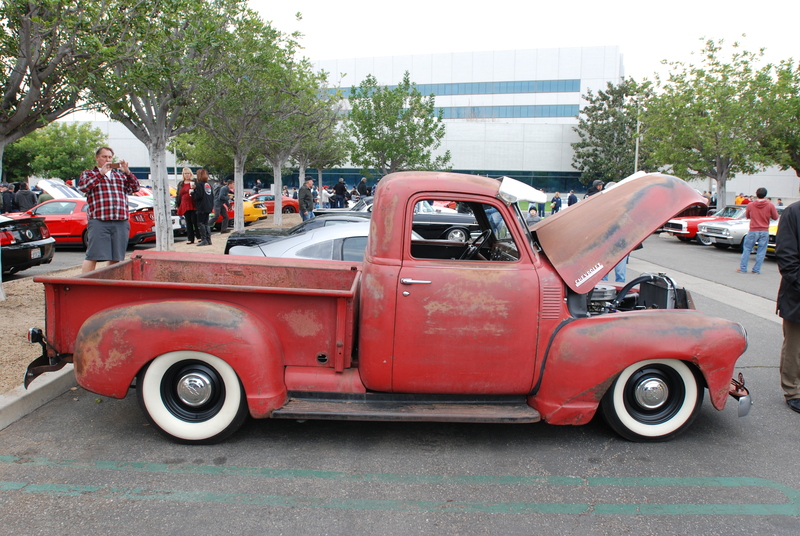 complete with a transplanted V8, and pin striped firewall. 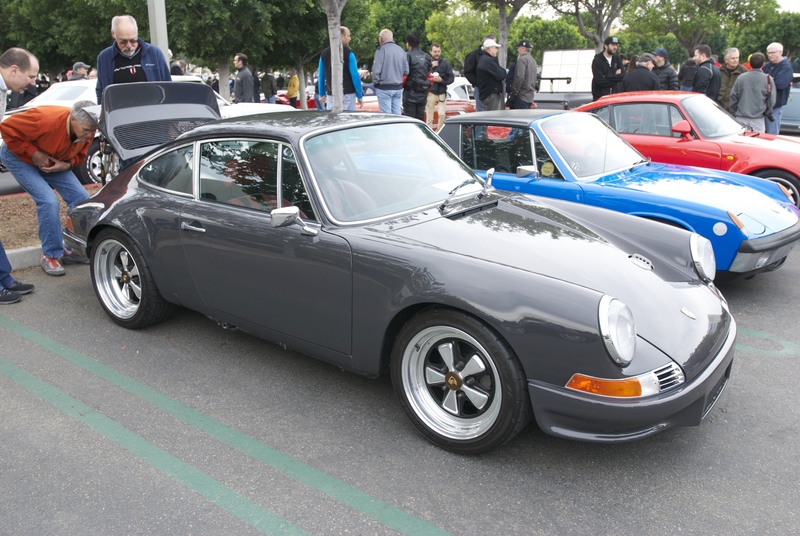 Another of the highly modified, standout Porsche 911s present the morning of December 20th. 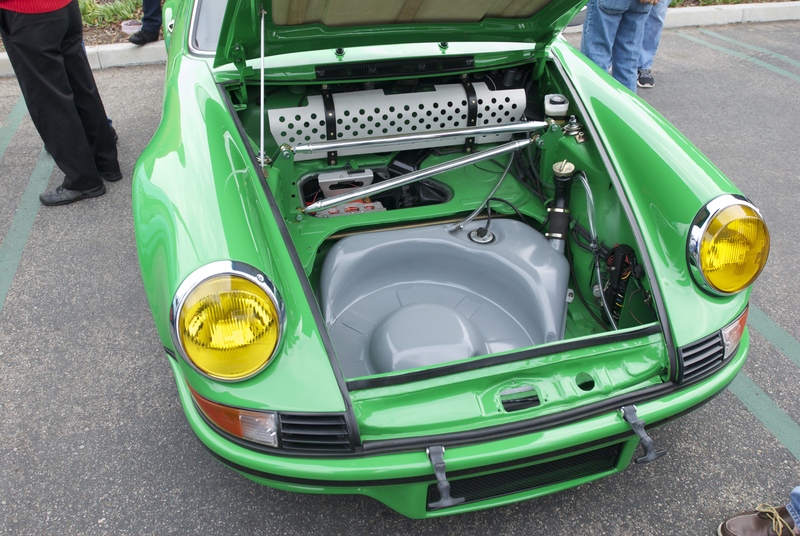 One Viper Green, 1973 Carrera RSR recreation, complete with an updated 3.6 liter motor. 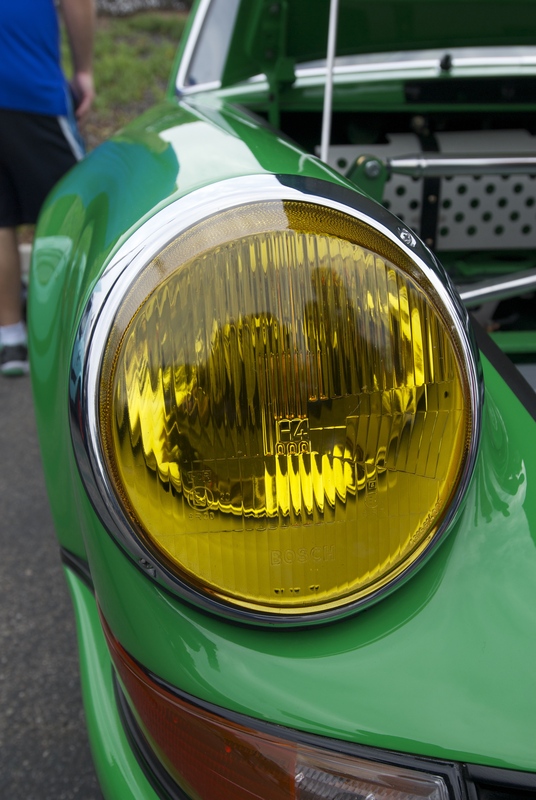 A close up view of the European spec, amber H4 headlight lens (as equipped on 1970s vintage Porsche 911s destined for delivery in France). 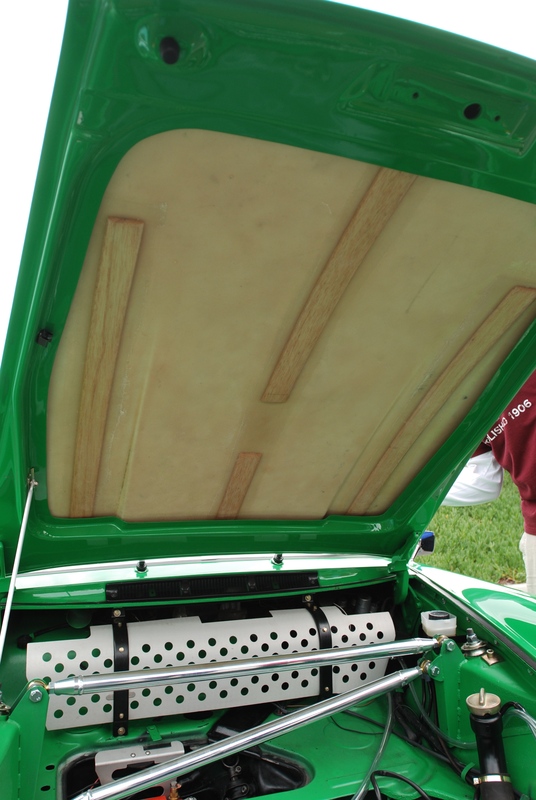 As observed; a fiberglass front hood, painted on the outside, but with an underside left unpainted, revealing and the fiberglass hood skin, and the period correct, strategically placed balsa wood stiffeners. 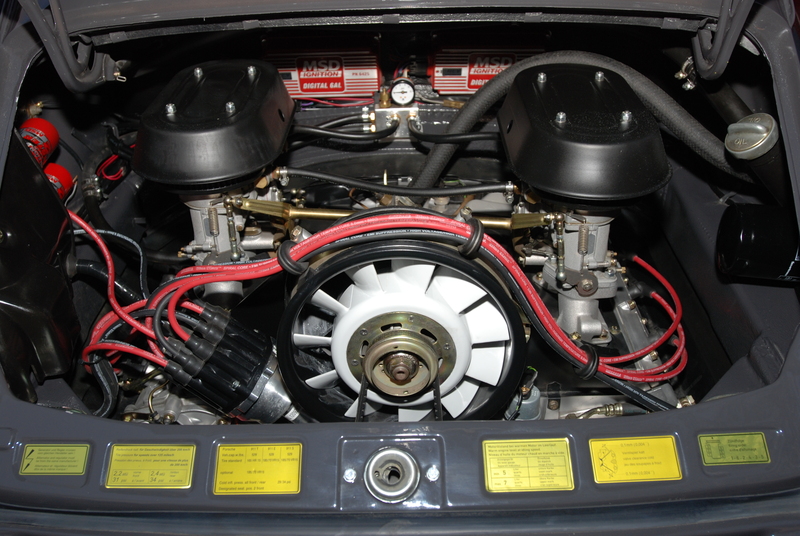 Another unique detail was the relocation of the fuel filler; repositioned to the inside of the trunk area by the left fender, thus avoiding the need to cut a hole into the front hood. And lastly, to deliver race car handling and provide front suspension rigidity, was the massive silver, triangulated RSR inspired strut bar. 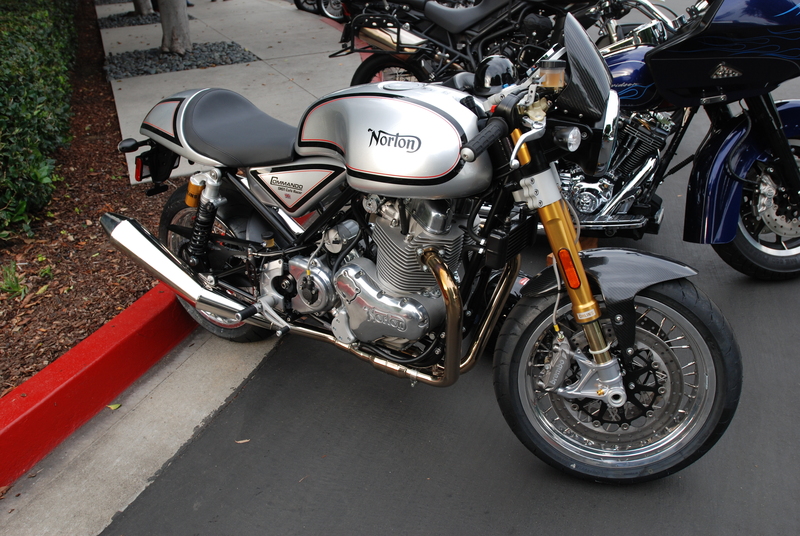 and to its right, a Norton Commando 967. 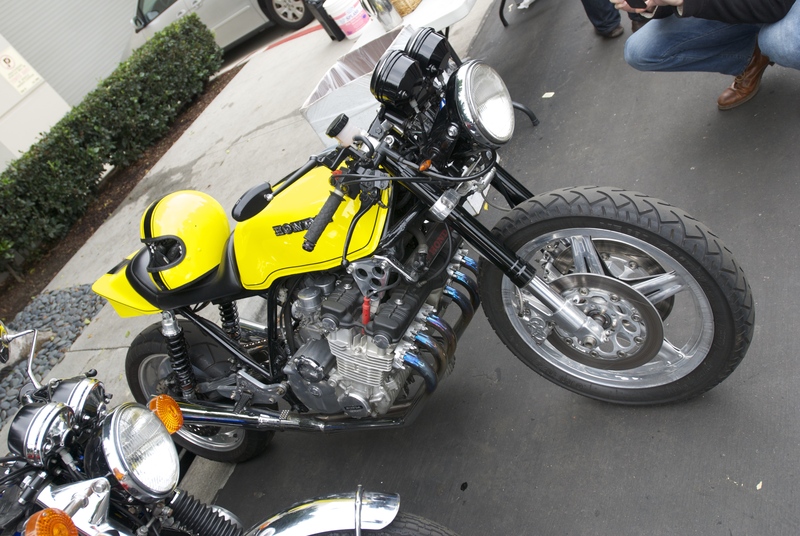 Around the corner, at the opposite end or motorcycle row was one crazy, custom-built, Honda 6 cylinder street racer. 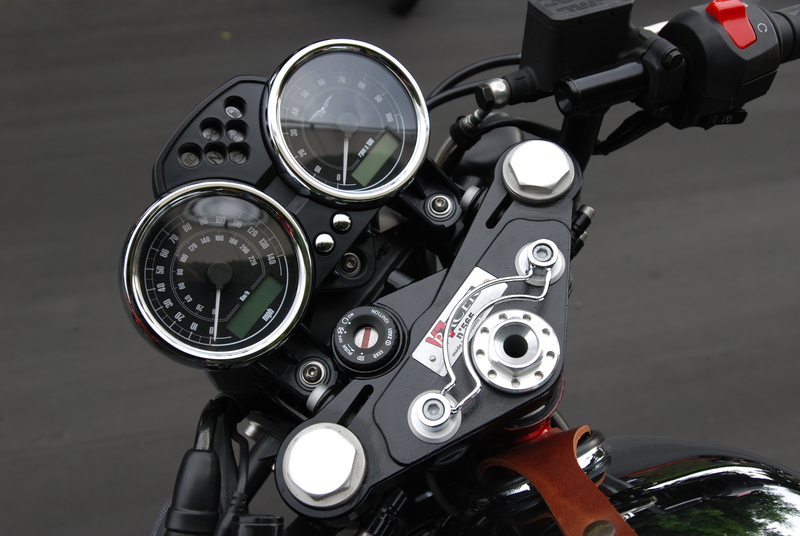 Hearing this motorcycle start-up and run was truly unique. 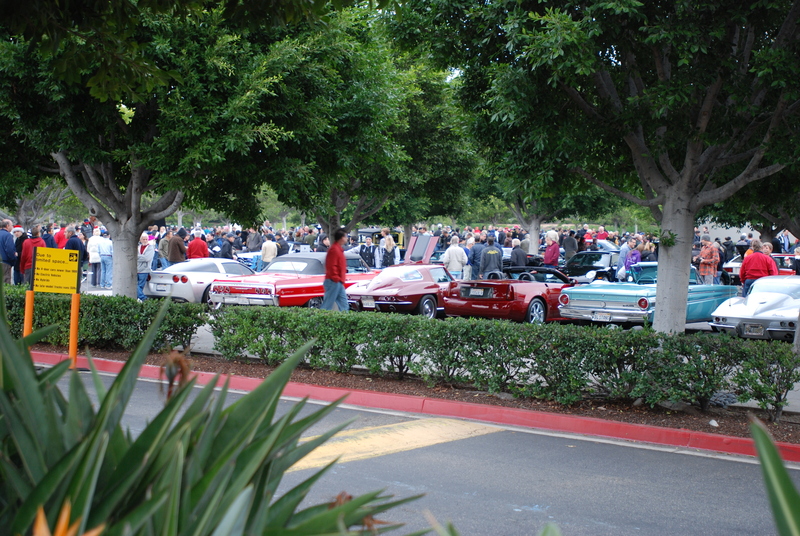 Last up, and only revealed once the crowds began to thin, was another trio of Porsches mimicking a reverse Oreo cookie. 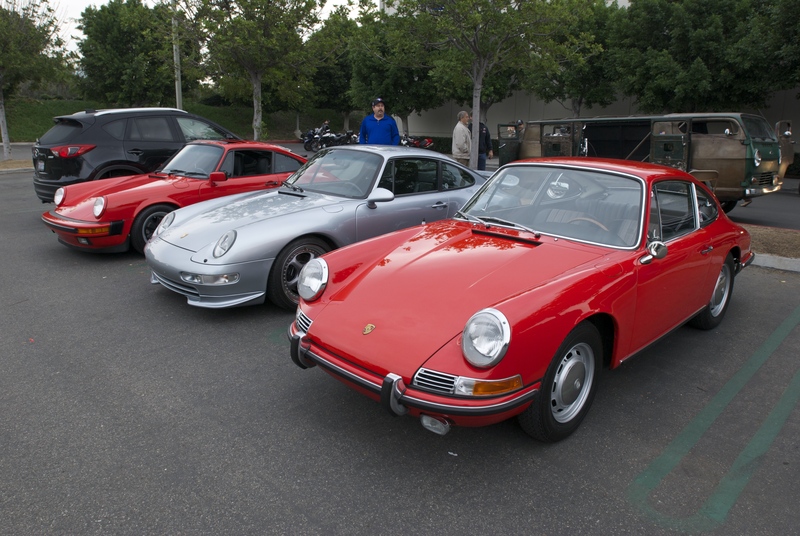 The three cars represented Porsche styling from mild to wild; starting on the right, a 1986 911 Carrera, with a stock Narrow body. 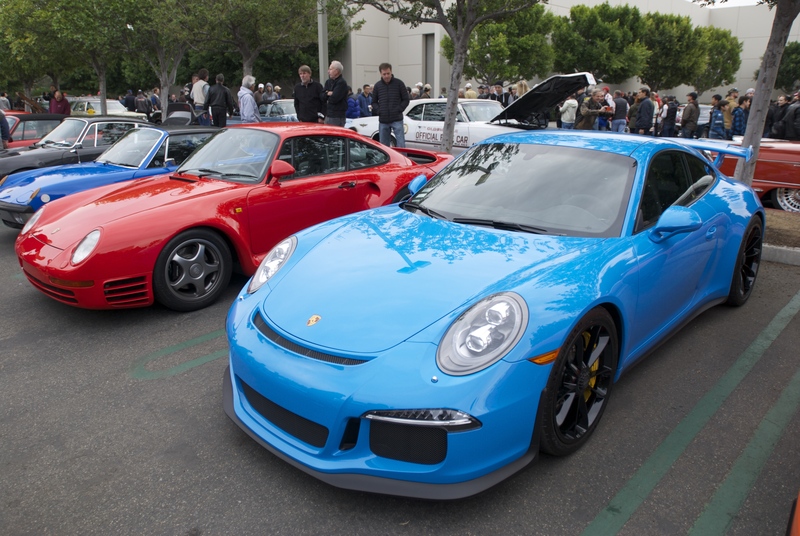 In the middle, a black 1987 Porsche 930 turbo, complete with the front and rear turbo flares and signature whale tail rear wing. To its left was the Porsche representing “wild”; the white Porsche 964 turbo, having been given the “RWB”(Rauh-Welt Begriff) treatment. 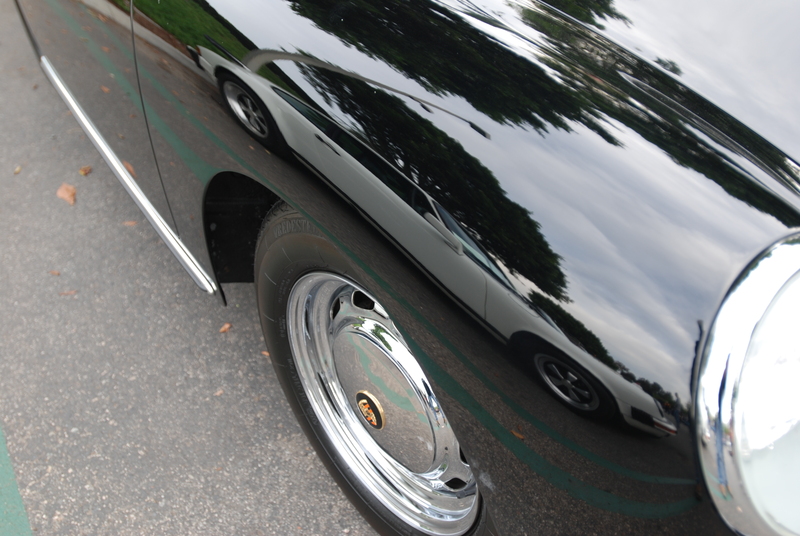 Typical modifications comprise wide body fender flares, suspension alterations and custom wheel upgrades. 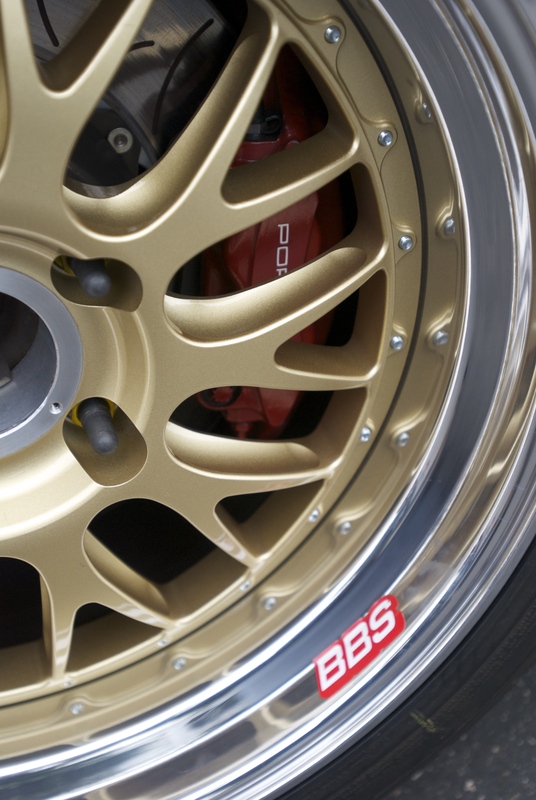 The unique signature wheels found on RWB Porsches are 3 piece forged modular “Tarmacs”, sourced from the local custom wheel company fifteen52 ( fifteen52.us). Even the rear wing received the RWB treatment, which consists of the incorporation of a carbon fiber, Porsche GT2 EVO top wing element, complete with custom end plates. And with that, the mornings gathering came to a close. After discussing our plans to meet up the following week for the last cars&coffee/Irvine, which would include a post event breakfast caravan, we all headed off to our respective destinations. 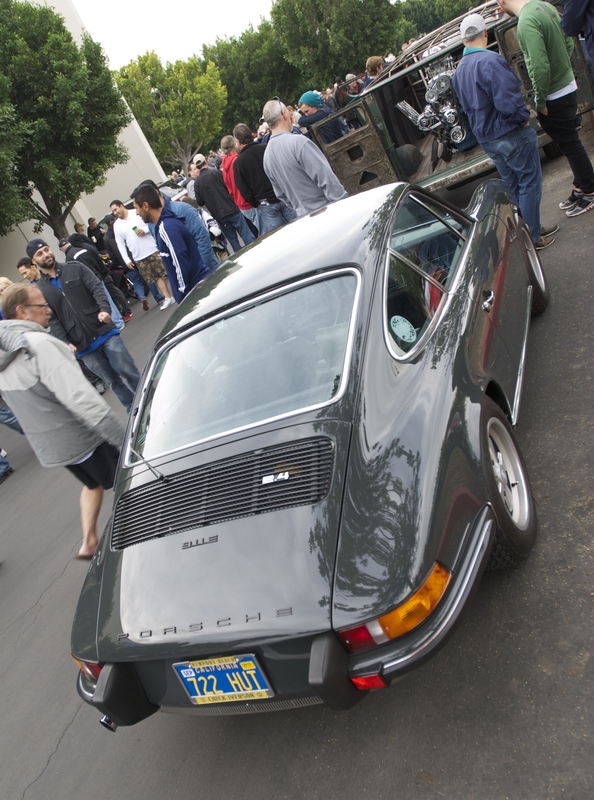 Unfortunately, Sunday morning did not get off to a smooth start, the result of an email blast that was sent out from the organizers of cars&coffee /Irvine. The email stated that due to the massive crowds that showed up for the December 20th event, and because of the excessive overcrowding experienced, and their fear for the participants safety, the following gathering on December 27th was regretfully being cancelled. 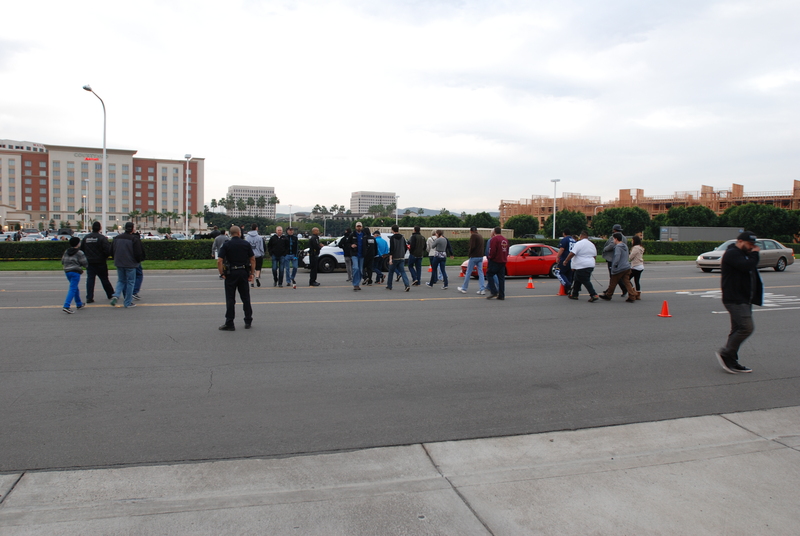 Thus, the December 20, 2014 / “next to last event” had in fact become the final cars&coffee/Irvine gathering that we all would attend. 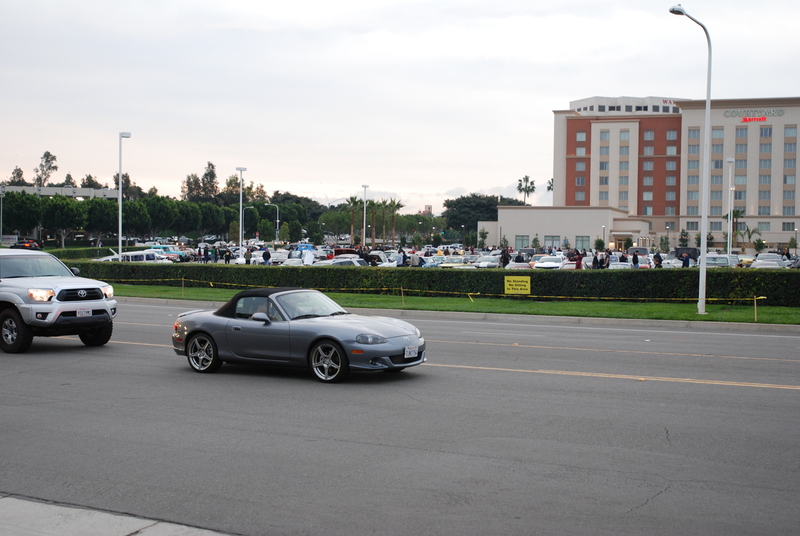 After the initial shock wore off, along with my anger towards those who had been so rude towards the event organizers, I went to work on creating this blog post as a way to celebrate what I had discovered my very first time attending cars&coffee back in 2008. 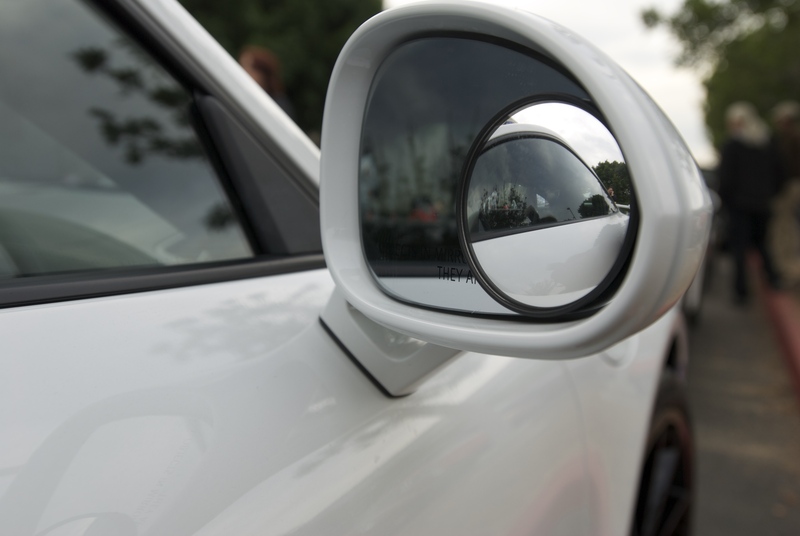 The event was truly about the cars and their owners, the stories shared each week with each new discovery, and the friendships made. In my six years of weekly attendance, the kindness of those in attendance far outweighed the rare occasions of rudeness that did occur, and that occurred on Saturday. A huge thank you is owed to the organizers John and Linda Clinard, Freeman Thomas and the host of volunteers, who over the years made each weeks gathering a huge success. And a big thank you to the catering team, who each week served up a smile with every hot coffee, hot chocolate, donut, or breakfast burritos, to keep the participants well fueled for their Saturday morning adventures. So here’s to the continued success and growth of our new, Saturday morning car show.